I don’t think I could’ve timed parenthood more perfectly than to have two-year-olds just as the Muppets are making a comeback. I pity those children born during the late 90s and early 00s. Muppet Treasure Island? My sympathies, Millennials. My sympathies. My kids, on the other hand, know only the salad days of Kermit & Crew. The Show. The Movie. The Merchandise. Ah yes, the Merchandise. Now, thanks to this new film, their favorite felt friends are everywhere. Nothing gets them more excited than seeing a Muppet billboard. Sutton seems to be particularly smitten. To be fair, she doesn’t like all of Jim Henson’s creations. Animal freaks her out a little. And this guy frightens her… kind of. No question about it, she gets most excited and she laughs the loudest when they’re on screen. My sweet little girl loves those two obnoxious old coots who laugh at their own terrible jokes. Drew and I couldn’t figure it out. Was it because the other characters’ humor was too subtle for her? 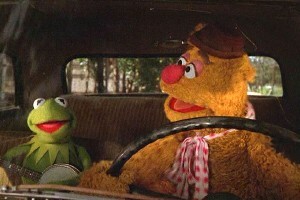 But if that were the case, why not Fozzie? He’s practically begging for the affection of the toddler crowd with his broad comic schtick. Then, a couple of days ago, a new theory emerged. 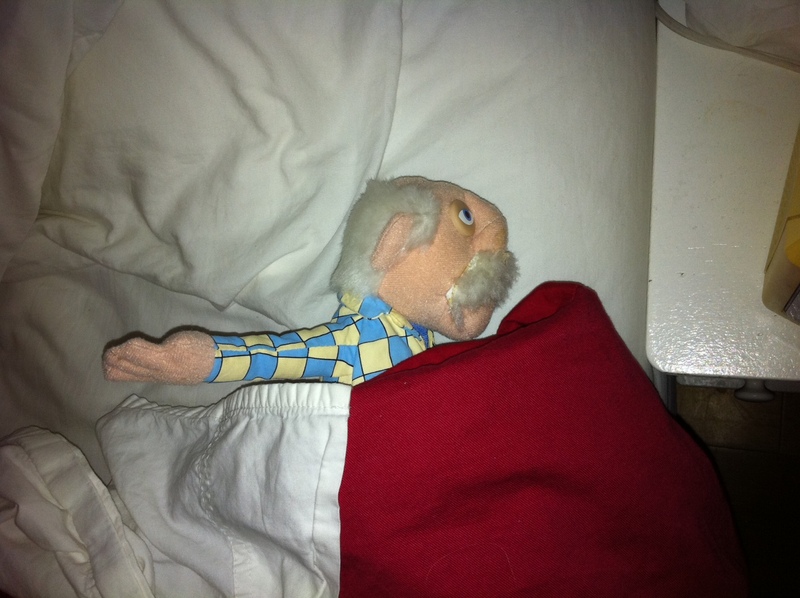 Sutton was playing with her Statler and Waldorf dolls, when she decided to put them down for a nap. 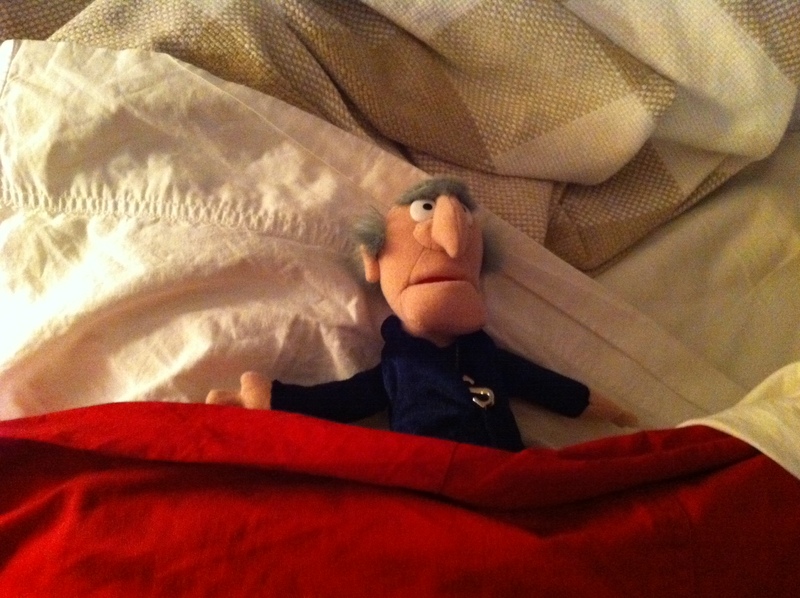 She tucked them in, turned the lights out, then shushed me, because Statler and Waldorf were sleeping. Whenever something ridiculously cute happens while Drew’s at work, I take pictures so I can send them to him. But Drew read into it a little more than I expected. He wrote back right away, concerned. The more I thought about it, the more sense it made. Those two guys in the box seats have really good chemistry. They crack each other up. They sit very close together. To this little girl, two obnoxious old coots who laugh at their own terrible jokes… are a lot like her daddies. And to think, everyone was so sure Bert and Ernie were the gay ones. I think Animal scared me when I was a kid, too, so that explains where she gets it from. He’s undiagnosed ADD, if you ask me. I’m looking forward to the new movie, too. I hope they don’t mess it up! I am getting my son the third season of the Muppet show for his birthday, and we’re sending one to my niece for Christmas. Truly a classic. Jim Henson was a genius. And there are definitely worse people to be compared to that Waldorf! I need to get the kids the Muppet show DVDs, too. They’ve seen clips of it on YouTube, but that’s it. I love the idea of them getting to know 70s stars like Joel Grey and Lily Tomlin. Very similar thing but at 6 years old with two barbie dolls. And she was playing our Nanna Lyn and Nanna Janet as the two barbies. Mum tells how proud she was of our easy acceptance at the change of the family situation. I love that even at two years old kids are coined into a situation and the fact that she chose two chummy characters is even more awesome! That is such an adorable and heartwarming story. Thanks for sharing! I often say I’d like to see the world through my daughter’s eyes for a little while. You achieved that. Kids are amazing, insightful little creatures, aren’t they? Yeah, it makes me wish I’d studied child psychology. It’s fascinating to ponder what they’re thinking. One of the sweetest things I’ve read in a long while! Sutton’s Daddies have done a terrific job with her and I love her clear, innocent view of the muppets! She obviously has a healthy view of her parents and you guys are to be commended. Happy Thanksgiving! Thanks, Lorraine! Gobble gobble to you, too! This made me crack up, both because we have a muppet loving 3-year-old in our house, and because the idea of your kids identifying with Statler and Waldorf as a family unit just puts a big smile on my face. My daughter is a passionate fan of the muppet show, and has learned the words to Broadway Baby direct from Valerie Harper, with, as in your case, some artistic license for interpretation. Thanks, Matt. We haven’t seen Valerie Harper yet. We’ll have to check that out. I love looking at the world through the eyes of a child. I found your blog a few days ago via a friend on FB. I loved your 5 people you meet post. Hopefully we can be new BFF’s! You got it! I love that people are sharing my stuff on FB. Thanks for commenting! Aww, this brought a tear to my eye. Or two. 🙂 I will never see Statler and Waldorf the same again. I came across your blog because of Freshly Pressed. The article about The Five People You Meet As a Gay Dad was brilliant (you left out my category though – mom of a gay son who would be so excited because I cannot wait to be a grandma and would just be grinning ear to ear while asking a million questions – I guess I’d be category 1 on steroids). 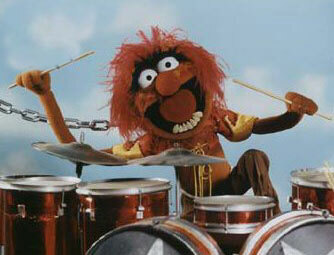 And then you write about the Muppets! My son and I are die hard Sesame Street fans but that pretty much encompasses all the Muppets as well…Your writing is wonderful and engaging and takes me back to my favourite time….raising my children! Enjoy every moment as they are the best moments. 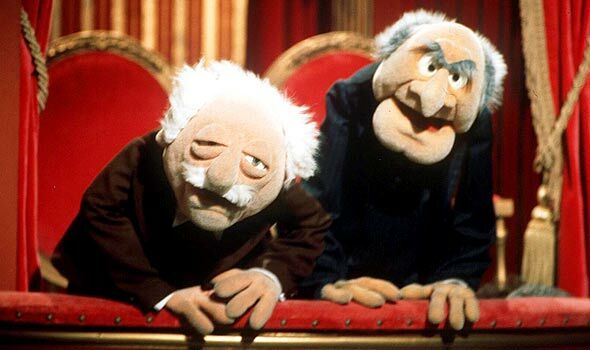 I was too old for Sesame Street but I loved the Muppet Show, and Statler and Waldorf were two of my favorites as well. The guest stars they got for that show (Miss Piggy tearing off Rudolph Nureyev’s towel as he fled from the sauna!) and for the movies were amazing. Yeah, it’s such a great time capsule of the 70s and early 80s. I’m glad my kids can still appreciate it 30 years later. So Jerry are you Statler or Waldorf? :). Also, Katie went to a sneak of the movie this weekend and sat through the whole thing! She loved it and freKed out when she saw the billboard at a bus stop today. I think Sutton is going to have a great time. 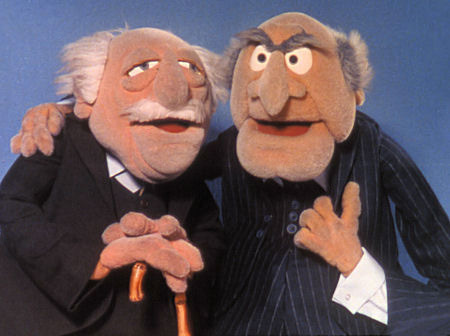 Hopefully Statler and Waldorf will also enjoy the movie! Based on where Sutton put the dolls, I would be Waldorf. But wait, did you see the movie with Katie? If so, I need details. How was it? And did Katie go to the PREMIERE? She’s such a well-connected 2-year-old! 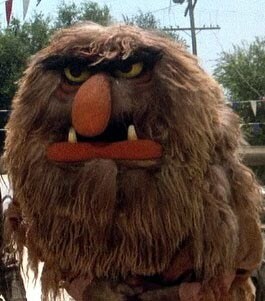 Is it weird and/or wrong that I’ve taught my 3 year old son (who is also a big Muppet fan) to say “Yeth?” when I say “Myth! Myth!” ?